This professional style 8ft x 6ft Pro Football Goal is perfect for sports fans who want to practice their skills with a real goal. Exclusive to Smyths Toys Superstores, this sturdy football goal has a flexible white frame with screw-fix joints for extra durability. 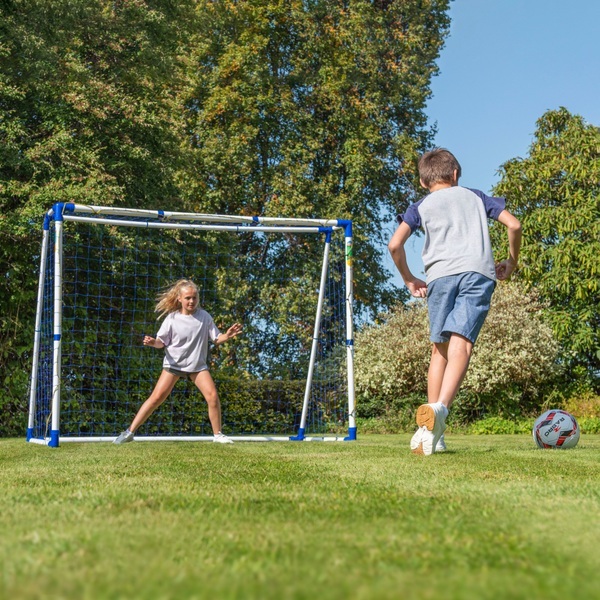 The freestanding 8ft x 6ft Pro Football Goal is ideal for kickabouts, matches, and practicing your shooting skills in the back garden. The pole lengths that make up the 8ft x 6ft Pro Football Goal can be assembled easily, without the need for tools. It’s just as simple to disassemble your goal for more convenient storage, so you can quickly convert your garden from imagined football stadium to lawn and back again. The 8ft x 6ft Pro Football Goal is sure to get your football fans playing outdoors. Playing football and other team sports is great for developing competitiveness and teamwork while keeping kids active and social. The 8ft x 6ft Pro Football Goal is designed for durability and portability, so your kids can enjo years of versatile outdoor fun.